"Mom and Dad need help with all their stuff, and honestly, I'm getting worn out trying to help them." When seniors are downsizing from the house they've been in for over 50 years, it can be overwhelming. Repeatedly we hear: "I don't know where to start." Often there are tears. They need help dealing with all the stuff - whether it is the stuff in their home or the emotional stuff they are faced with. 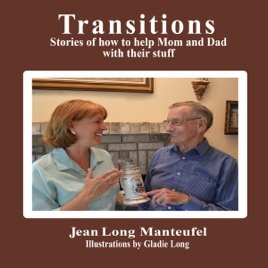 Transitions is a monthly column to guide seniors and their children through these changes. It is about the emotion and the commotion of making the transition. With ideas for both generations, the goal is to coach, encourage, and guide folks through the process. This is a collection of 50 of those columns. The stories often aren't just one person's story. If they feel familiar, it is because there are many of us sharing the same challenges. You aren't alone.